Are you concerned about the amount of electro-magnetic radiation in your home and around your children? 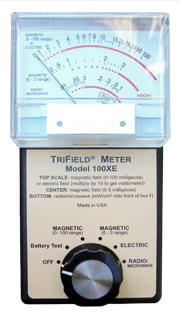 This EMF meter is an excellent choice for a simple to use meter both in and out of the home or work place. For those wanting a more sophisticated electro-magnetic radiation unit and are willing to learn to operate the EMF Spy, (pictured at right) this is an excellent unit. 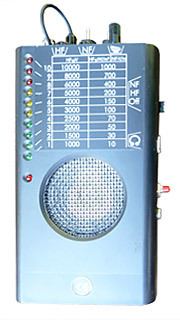 This EMF meter has Hf & Nf ranges and with three different antennas is a very versatile unit. With this EMF meter you can check your reading glasses frames, the wire in your bra, or any metallic object. One of the included external antennas can even be put into the bark of a tree for field strength testing.